Though not due till August, BYE BYE, BABY is starting to generate some very nice coverage. Here’s the Tor/Forge Blog info on it. Even better are several really great reviews, like this one from the Not the Baseball Pitcher site. Ed Gorman – that terrific writer, and author of his own first-rate Marilyn thriller – has a lovely and I think quite insightful review about the first new Heller in a decade. But KISS HER GOODBYE continues to get strong notices, too, like this on at a major Kindle site. I’ve stirred some interest and even commentary on my admitted displeasure with the cover to the new Heller. I am pleased by the quality of the photograph, and thrilled that my publisher ponied up for a major photographic shoot from the excellent Thalicer Image Studio. 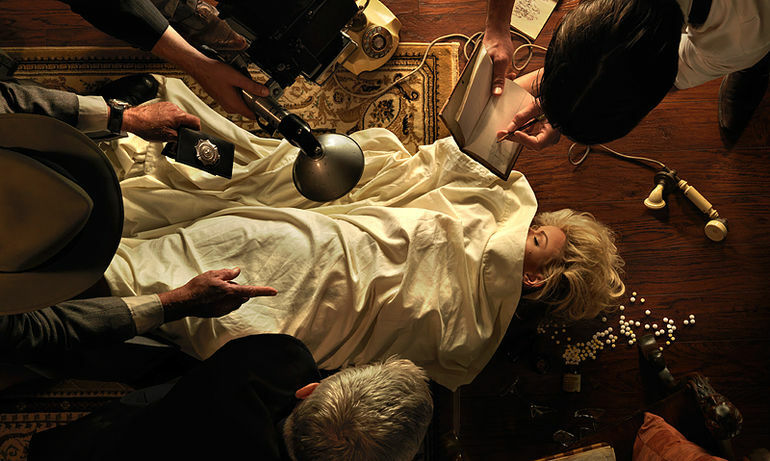 But because of fears that the MM estate might object to too overt a Marilyn image, the publisher chose what I consider to be the weakest (and certainly most historically inaccurate) of the photos from the shoot. One of the rejects is attached – and it makes my point, because it’s the image Thalicer’s agent chose to post on the website intended to drum up business – not the actual photo used. The angle of the photo also demonstrates that the Mickey Spillane lookalike is thrusting forward a police badge, meaning he is not intended to be Nate Heller, as some (unfortunately) are assuming. Throughout my career, my lack of input in the covers of my books (despite my background in graphic arts and filmmaking) as well as the frequent battles over my titles (RED SKY IN MORNING should have been called USS POWDERKEG, for example) have been a big source of irritation. On the other hand, sometimes the publishers have been right – my original title for TRUE DETECTIVE was TOWER TOWN, for example…though I was the one who came up with TRUE DETECTIVE as an alternative. But CARNAL HOURS and FLYING BLIND are among titles I fought for, and thankfully prevailed.